I’ll be honest, I’m a bit late to the party. I’ve only just completed Eric Ries book, ‘The Lean Startup’, that was published to much acclaim last year. I put off reading it, believing it would be another generic how-to-start-a-high-tech-business book. I already have a bookshelf full of these kinds of book, most of them unread beyond the initial chapter. But now I’ve read it I think that it should be obligatory reading for any UX person. What I like about the book is that it puts UX at the very heart of new product design — and does so in language that will make managers sit up and take notice. Here’s my version of the digested read. Designing new products or services is risky because there are so many uncertainties. The design team has a set of hypotheses — for example, about users, their goals and what they will pay for — and to reduce uncertainty, these hypotheses need to be tested. We identify these hypotheses and then design experiments to test them out. We run these tests on minimal versions of the product with limited functionality because these minimal systems are quick and easy to create. Design takes place within an iterative cycle of build-measure-learn where we test ideas with users as early as possible. Based on the test results, we continue to develop the idea or we ‘pivot’ (change direction) and develop a product that has more value for customers. Sound familiar? There’s obviously a lot more in the book than these five points but I hope there’s enough here to make you realise how congruent this approach is with user centred design. UX practitioners have a lot to contribute to this way of working but I wanted particularly to focus on the item I’ve numbered 4 in the list above: iterative design and testing. Through necessity, people in UX have developed many speedy techniques for gleaning feedback from users and I wanted to review some of those. Ries mentions a few in his book (such as a video demonstration and what he calls a ‘concierge minimum viable product’ where you create a highly personalised version of the system to uncover customer needs) but I wanted to mention three other techniques. These techniques have three things in common. First, they cost virtually nothing and can be completed in a few days, so they support Ries’ notion of moving through the loop as quickly a possible. Second, they focus on user behaviour rather than people’s opinions so they address another issue that Ries highlights: the fact that customers often don’t know what they want. Third, Ries points out that development teams are often reluctant to involve users until they have something fairly complete to show to them. These techniques allow us to test our business idea while it’s still an idea — before developers have written a single line of code. Hypothesis testing with a paper prototype. Hypothesis testing with the Wizard of Oz. The user problem you’re trying to solve. How the user encounters your solution. How your solution will work (from the user’s perspective). How the user will benefit. 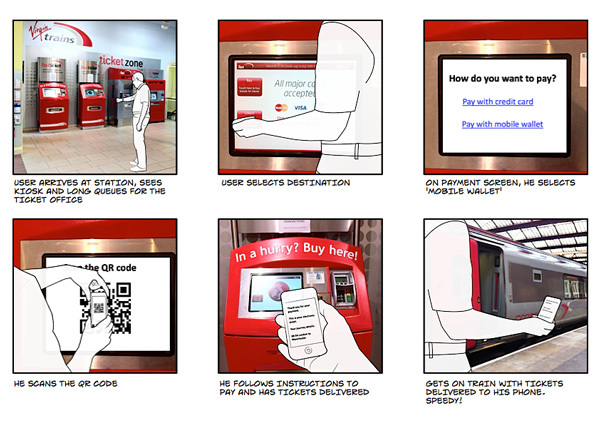 As storyboards are inherently visual, let’s look at a storyboard for a new product development idea. Imagine we’re thinking of developing a new way for people to pay for train tickets at rail stations using an electronic payment service, like PayPal, on their mobile phone (a "mobile wallet"). Our initial idea is that people will start the task by using a kiosk at the station where they can choose their ticket. At the payment stage, they will scan a QR code that’s generated on the kiosk screen. Scanning the QR code takes the user to a payment site where they can pay and get the tickets delivered to their phone. Figure 1: A rough sketch showing how people might interact with the system. Click the image for a larger view. Figure 2: A slightly more sophisticated version of Figure 1. I created the images by tracing over suitably-posed photographs and then I combined the sketches with photographs taken at a train station. Click the image for a larger view. Will people be willing to use their mobile phone to pay or might they prefer to just put their credit card in the kiosk and pay that way? Do most people have the software on their phone to scan QR codes? Do people even know what a QR code is? How will people feel about electronic ticket delivery? Do people have any anxieties about not having a physical ticket? Is the problem (not being able to pay via mobile) serious enough to warrant the solution? If we spend an hour at a railway terminus and speak with 50 people and only 3 of them report this as a problem, then we need to pivot and find out what the problem really is (for example, by using laddering to uncover core values). If the problem is serious enough, then we test the second hypothesis: is our solution appropriate? We test this by first giving them some context to the activity and then asking them to talk us through the sequence of steps. After each frame we ask a simple question: “Is this a step that you can see yourself, personally, doing?” Again, we can count the numbers of people who say Yes or No at each step. For example, as a result of testing this solution with customers, we might find that most people see little benefit in paying by phone because it simply adds more steps to the process. So instead, we might ‘pivot’ and come up with a new idea: perhaps we should display a poster near the kiosk with QR codes next to the most popular journeys from the station. People can then scan their journey and complete the whole process on the phone without needing to use the kiosk at all. We then storyboard this new idea, and test again. A second lean way to evaluate your business idea is to create a paper prototype that shows in detail the steps that you expect the user to take to achieve their goals. Paper prototypes combine hand drawn buttons, labels and user interface elements with sticky notes to help you craft an interactive experience. The idea is that you sit users down in front of the prototype, give them a scenario (“Buy a ticket from London to Manchester”) and tell them to use their finger as the mouse. As each new selection is made, you update the screen with sticky notes to reflect the choices that have been made. Paper prototypes are quick to create — if you spend more than a couple of hours, you’re taking too long — and will give you definitive feedback on the usability or otherwise of the workflow you’ve created. At the end of the test, you'll know the percentage of users who could complete the task: the acid measure of usability. When I’ve written about paper prototyping in the past, people have been quick to comment that paper prototyping is old fashioned and that electronic prototyping tools are much more efficient. Personally, I don’t see this as an either-or: there’s room in the design process for both types of prototyping. However, the time for electronic prototyping isn’t at the initial stage of an idea. As Ries points out, you want to minimise your time through the iteration loop so you can learn most quickly. Paper prototyping is perfect for that initial phase because it’s much quicker than electronic prototyping and easily amenable to modification as you test it out with users. Prototyping, as Jeff Gothelf has pointed out, is the fastest way between you and your customers. With a Wizard of Oz test, the user interacts with a system which appears to be fully programmed but in fact all of the system’s responses are being controlled by a human operator, just like in the eponymous musical. One of my favourite examples of this — the Mechanical Turk — actually predates the movie by nearly 200 years and serves as a wonderful example of the technique. The Mechanical Turk was a large, chess-playing machine built around 1770 (see Figure 1). If you played a game of chess against the machine, you would sit down at a proper-sized chess table opposite a mannikin wearing Turkish dress (hence the name). The mannikin would grasp and move chess pieces around the table in response to your moves. It would also probably beat you — the Turk was able to beat most human chess players that it played against, including (apparently) Napoleon and Benjamin Franklin. Figure 1: An engraving of the Mechanical Turk. (From Wikipedia). The machine, however, was a fake. Hidden inside was a human chess player who moved the pieces around using magnets. Although some people suspected it was a hoax, the illusion was so well created that it was many years before the machine’s inner workings were revealed. For our purposes, what’s critical about the Turk was that people thought they were really playing against a machine. They had no idea that a human operator was hidden inside the box and animating the mannikin. To show how we can create a similar illusion with our business idea, let me give you a more up-to-date example. A while back I was working on the design of an interactive voice response system for a cinema booking system. The idea was that people could ask the system questions over the telephone (a bit like Apple’s Siri, although this was a long time before good speech recognition was in place). We pre-recorded a small number of responses that we knew we would have to use (e.g. “Can you say that again?”) but because we didn’t know the specific questions that people would ask, we couldn’t pre-record the answers. Instead, we used text to speech technology to create the illusion that the system was working, with me playing the Mechanical Turk. The user would ask a question, such as, “What films are showing this afternoon that are suitable for families?” and then I would quickly type in, “We have 4 films suitable for families”. The system would read this to the user over the phone in a text-to-speech, computerised voice. While this was being spoken, I would then type in the names of the films. It was hectic and required fast typing skills but our users truly believed that were interacting with a live system that could do excellent speech recognition. We were able to use this to test out the business idea and identify the most common questions before the client invested in the extensive (and expensive) technology to support it. Early and continual focus on users and their tasks. Empirical measurement of user behaviour. (For more detail on these principles, download our free Fable of the User Centred Designer). I’m delighted that Ries’ (an entrepreneur-in-residence at the Harvard Business School) has brought these principles to the attention of senior managers since it now makes our job much easier. With your help, we can make sure that the idea of testing business ideas by developing prototypes — dozens of prototypes, not just a couple of iterations — becomes commonplace. This article is tagged iterative design, strategy, prototyping, usability testing.